Support for this brief was provided by the National Pharmaceutical Council. Permitted Pre-Deductible Coverage in HSA-HDHPs: The IRS "Safe Harbor"
Under this IRS guidance, until the deductible is met, coverage does not include "any service or benefit intended to treat an existing illness, injury, or condition, including drugs or medications. "15 This narrow definition of the "safe harbor" is highly problematic. Primary prevention, while important, is a small component of overall health spending. By contrast, spending on chronic disease encompasses a substantial majority of total US health care expenditures.16 For those with medical conditions, access to affordable clinician visits, diagnostic testing and prescription medications are critical components of disease management. (iii) requires specialized delivery systems across domains of care. HDHPs are appealing to employers because of their low premiums. If enhancements in prescription drug coverage are not offset by reductions in spending on other services (e.g., emergency visits and hospitalizations), adding pre-deductible coverage for medications used to treat chronic conditions could increase premiums and plan actuarial value (AV). Accordingly, the aims of this analysis were to quantify the potential financial impact on patient out of pocket costs, plan expenditures, and plan AV of providing pre-deductible coverage for 57 drug classes used to treat 11 chronic conditions (Table 1). Conditions and drug classes were selected based on the disease prevalence and contribution to member- and plan-paid expenditures. Volume: Lower patient out of pocket costs tends to increase utilization. An estimate of enrollees’ responsiveness to changes in price (i.e., elasticity of demand) was used to determine increases in utilization and related expenditures. Shift: Independent of volume effects, lower consumer cost-sharing shifts the cost burden from the patient to the plan. This analysis accounted for changes in the apportionment of expenditures. Offsets: In some clinical scenarios, greater utilization of high-value therapies can decrease spending on other services (e.g. hospitalizations). This analysis did not account for these offsets. 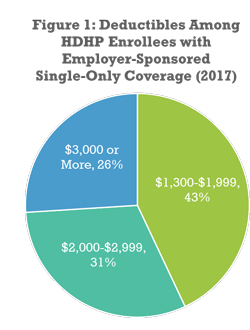 An HSA-qualified HDHP with a deductible of $2,000 was used as a baseline for the analysis (AV approximated 74 percent). Once the plan deductible was satisfied, this simulated plan imposed a 10 percent coinsurance for all covered services (including drugs) until reaching the out-of-pocket maximum of $6,500. An HDHP with permitted pre-deductible drug coverage for the specified 57 drug classes was simulated. Consumer cost-sharing was $5 for generics, $40 for branded non-specialty drugs, and 10 percent coinsurance for specialty drugs. Table 2 shows expected changes in plan- and member-paid expenses between the baseline HDHP and an HDHP with expanded drug coverage, as well as impact on plan AV. Estimated increases in premiums and deductibles needed to keep plan expenditures neutral are also presented. The modest increase in plan expenditures were split between increases in medication utilization and shifting allocation of drug expenditures. Covering all 57 targeted classes on a pre-deductible basis with $5/$40/10% cost-sharing would require an increase in premium of less than 2 percent. These estimates should be considered "ballpark," as limitations apply to the underlying analyses. As Table 3 shows, limitations tend to both over- and under-estimate effect. This summary of limitations is not exhaustive. Drug rebates not included in estimation of plan-paid price. Medical offsets due to better disease control not included in analysis. Reduced medical utilization due to greater delays in satisfying deductible (i.e., patients with first-dollar coverage for targeted drugs may be less likely to satisfy their plans’ general deductibles). Data on copay card use were unavailable (overstate decrease in patient PMPM liability). Analyses modeled the behavior of patients with history of previous drug use, including those with suboptimal adherence. Patients not initiating indicated therapy due to high cost-sharing not included in analysis. Analyses relied on a standard population, which may not be representative of any particular plan’s population. HDHPs are entrenched in the American healthcare landscape. The current policy that imposes high deductibles on all chronic disease services – independent of clinical value – to control spending has imparted a clinical and economic toll on Americans with chronic medical conditions. It is critical that regulations that prevent health plans from innovating be amended, such that plan designs that better meet the clinical and financial needs of millions of Americans may be made available. Bipartisan, bicameral legislation that allows HDHPs the flexibility to provide pre-deductible coverage of high value services that treat chronic diseases has been introduced. 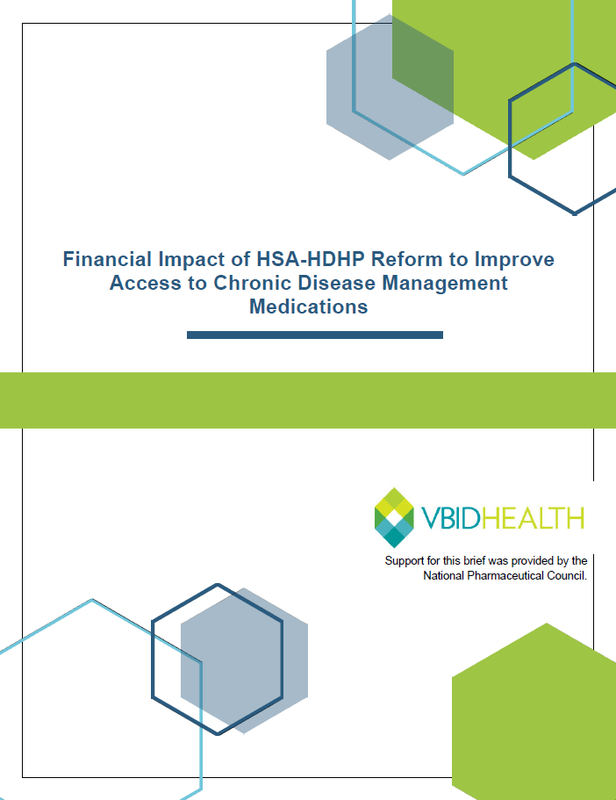 The claims-based simulations reported here demonstrate that generous enhancements in HDHP prescription drug coverage for several chronic conditions would lower consumer out of pocket costs and result in only modest impacts on premiums or deductibles. Expanding the IRS "safe harbor" to permit coverage of high value prescription drugs prior to meeting the plan's deductible would increase the attractiveness and clinical effectiveness of HSA-HDHPs. Adoption of this policy has the potential to mitigate cost-related non-adherence, enhance patient-centered outcomes, allow for premiums lower than most other plan types, and substantially reduce aggregate health care expenditures. Cohen R, Zammitti E. High-Deductible Health Plans and Financial Barriers to Medical Care: Early Release of Estimates from the National Health Interview Survey, 2016. Atlanta, GA: CDC; 2017. https://www.cdc.gov/nchs/data/nhis/earlyrelease/ERHDHP_Access_0617.pdf. Kaiser Family Foundation. Health Insurance Coverage of the Total Population. https://www.kff.org/other/state-indicator/total-population/. Published September 2017. Accessed May 9, 2018. Claxton G, Rae M, Long M, Damico A, Foster G, Whitmore H. Employer Health Benefits 2017. Kaiser Family Foundation, Health Research & Educational Trust, NORC at the University of Chicago; 2017. https://www.kff.org/health-costs/report/2017-employer-health-benefits-survey/. Accessed May 9, 2018. Collins SR, Rasmussen PW, Beutel S, Doty MM. The Problem of Underinsurance and How Rising Deductibles Will Make It Worse: Findings from the Commonwealth Fund Biennial Health Insurance Survey, 2014.; 2015. http://www.commonwealthfund.org/~/media/files/publications/issue-brief/2015/may/1817_collins_problem_of_underinsurance_ib.pdf. Accessed May 9, 2018. Kaiser Family Foundation. Preventive Services Covered by Private Health Plans under the Affordable Care Act. https://www.kff.org/other/state-indicator/total-population/. Published August 4, 2015. Accessed May 4, 2018. Internal Revenue Service. Preventive Health Services Required under Public Health Service Act Section 2713 and Preventive Care for Purposes of Health Savings Accounts. ; 2013. https://www.irs.gov/pub/irs-drop/n-13-57.pdf. Accessed May 4, 2018. Internal Revenue Service. Part III - Administrative, Procedural, and Miscellaneous. ; 2004. https://www.irs.gov/pub/irs-drop/n-04-23.pdf. Accessed May 4, 2018. Internal Revenue Service. Part III - Administrative, Procedural, and Miscellaneous. ; 2004. https://www.irs.gov/irb/2004-33_IRB#NOT-2004-50. Accessed May 4, 2018. Smarter Health Care Coalition. http://www.smarterhc.org. Accessed May 4, 2018. Buxbaum JD, Mafi JN, Fendrick AM. Tackling Low-Value Care: A New “Top Five” for Purchaser Action. November 2017. https://www.healthaffairs.org/do/10.1377/hblog20171117.664355/full/. Accessed May 9, 2018. "Increases in consumer out-of-pocket costs for health care have been associated with many deleterious consequences." "This narrow definition of the 'safe harbor' is highly problematic." "To enhance consumer choice and create a more robust HSA-HDHP marketplace, the Chronic Disease Management Act of 2018 has been introduced." "The aims of this analysis were to quantify the potential financial impact of providing pre-deductible coverage for drugs used to treat 11 chronic conditions." "Covering all 57 targeted classes on a pre-deductible basis would require an increase in premium of less than 2 percent." "Expanding the IRS 'safe harbor' has the potential to mitigate cost-related non-adherence, enhance patient-centered outcomes, allow for premiums lower than most other plan types, and substantially reduce aggregate health care expenditures."